A Interim Group Management Report 5 Executive Summary 12 Property-Casualty Insurance Operations 22 Life/Health Insurance Operations 28 Asset Management 32 Corporate and Other 35 Outlook 37 Balance Sheet Review 44 Reconciliations Interim Report Third Quarter and First Nine Months of 2014 Allianz Group 33 Earnings summaries 2014 to 2013 third quarter comparison Our operating result decreased by € 19 mn to a loss of € 248 mn. A € 29 mn decline in our operating result in Holding & Treasury was only partly compensated for by improvements in Banking and Alternative Investments. Our net result was stable at a loss of € 311 mn (3Q 2013: € 307 mn). The increase in our operating loss was almost offset by the increase in non-operating realized gains and positive tax effects. 2014 to 2013 first nine months comparison Our operating result improved by € 53 mn to a loss of € 689 mn. An increase in our loss in Holding & Treasury was more than compen- sated for by the recovery of our operating Banking result, which ben- efited from the closure of the ­Allianz Bank’s business operations in mid-2013. Our net result strengthened by € 553 mn to a loss of € 429 mn. This was primarily driven by a one-off benefit from pension revaluation with our German subsidiaries.1 It was only partly offset by lower non- operating realized gains as a result of the non-recurrence of gains related to our investment in The Hartford, which was sold in 2013. Operating earnings summaries by reportable segment Holding & Treasury 2014 to 2013 third quarter comparison Our operating loss increased by € 29 mn to € 267 mn. Higher pension costs and strategic IT investment costs were offset by the improve- ment in our net interest result. However, in the third quarter of 2013, the operating profit benefited from a € 26 mn reduction of a restruc- turing provision. Our net interest result improved by € 25 mn to a loss of € 11 mn. This was entirely driven by higher interest and similar income, which increased from € 47 mn to € 71 mn due to greater income from an increased volume of debt instruments but also from higher divi- dends on equities. Interest expenses, excluding interest expenses from external debt, remained unchanged at € 82 mn as the effects of lower interest expenses on internal debt and higher expenses related to a higher cash pool balanced each other out. 1 For further information on the one-off effect from pension revaluation, please refer to note 4 to the condensed consolidated interim financial statements. Administrative expenses (net), excluding acquisition-related expenses were up by € 22 mn to € 199 mn. This was mainly due to higher pension costs and numerous smaller effects. Our net fee and commission result worsened by € 8 mn to a loss of € 55 mn. This was primarily because of higher strategic IT investment costs – in particular related to our global data center consolidation project. During the third quarter of 2014 we reduced a restructuring pro- vision related to our global data center consolidation project by € 4 mn (3Q 2013: € 26 mn). Investment expenses remained unchanged at € 18 mn. 2014 to 2013 first nine months comparison Our operating loss increased by € 77 mn to € 760 mn. This was mainly a result of a € 38 mn deterioration in our net fee and commission result because of higher IT project startup costs and a decline linked to the above-mentioned restructuring charge reduction. In addition, an € 8 mn dip in our net interest result – which amounted to a loss of € 45 mn – also contributed to this development. This was largely due to lower interest and similar income, as the previous year’s figures benefited from interest payments on our silent participation in Commerz­bank, which was redeemed in 2013. However, it was partly offset by higher interest income from an increased volume of debt instruments and higher income from equities and associates. 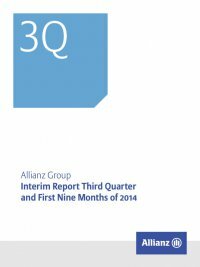 Banking2 2014 to 2013 third quarter comparison Our operating profit increased by € 7 mn to € 11 mn, mainly due to lower loan loss provisions. Our net interest, fee and commission result was stable at € 132 mn (3Q 2013: € 129 mn). The net interest result remained unchanged at € 83 mn as both interest and similar income and interest expenses decreased by € 5 mn due to the low interest yield environment. Our net fee and commission result was up by € 3 mn to € 49 mn. This slight increasewasmainlydrivenbytheallocationofaformerAssetManage- ment entity to the reportable segment Banking in Italy. Administrative expenses increased from € 109 mn to € 117 mn. This was largely due to higher commissions paid to financial agents in Italy. The above-mentioned allocation also contributed to this development. Our loan loss provisions decreased by € 11 mn to € 7 mn. This was mainly because of lower loan loss provisions related to our ship financing business in Germany. 2 Effective 1 January 2014, the ­Allianz Group allocated certain entities from the reportable segment Asset Management to the reportable segments German Speaking Countries, Western & Southern Europe and Growth Markets within the business segment Life/Health and to the reportable segment Banking.